Central Trains was a train operating company in the United Kingdom owned by National Express that operated the Central Trains franchise from March 1997 until November 2007. Created out of the Central division of Regional Railways, Central Trains passed into the private sector on 2 March 1997. The franchise was awarded to National Express Group, who maintained control of the company until its eventual demise in 2007. Central Trains employed over 2,400 staff. The company invested significantly in rolling stock, with significant orders for new trains placed and the fleet later further grown through the acquisition of trains made surplus by other companies. Despite a reduction in the area covered during the ten years of its existence, the company grew its core fleet from fewer than 300 passenger vehicles to a total of 379 – a capacity increase of over 28%. It also refurbished a number of its stations, introducing ticket gates, help points and live information boards. Central Trains also clamped down on vandalism on its trains and fare evasion, including through a controversial poster campaign publicising the names and addresses of passengers who had been fined for not having valid tickets. The franchise gained a reputation for poor timekeeping: its best performing period between 2000 and 2007 still saw one in six trains five minutes late or more, with punctuality dropping as low as 61% in 2003. The company also suffered from ongoing staff relations problems which led to extensive and long-lasting cancellations of Sunday services. Following a government policy announced in 2004, Central Trains was eventually disbanded in November 2007 with its services dispersed amongst London Midland, East Midlands Trains and CrossCountry. At its greatest extent, Central Trains operated 253 stations and provided services covering 1,534 miles of the UK's railway network, covering most of central England and Mid Wales. In its last years, the company saw 43 million passenger journeys and a total of 930 million miles travelled every year. Services ranged from rural and local services to flagship express services originally branded as Alphaline and later developed into Central Citylink. In the West Midlands, the company also operated the extensive urban rail services under contract to the CENTRO. (later Network West Midlands). In the late 1990s, Central Trains offered many through services between routes which had previously been shown as self-contained in public timetables. For example, where a train had previously been timetabled to work a Shrewsbury to Birmingham service followed by a Birmingham to Leicester service, the workings were combined and shown as a single direct Shrewsbury – Birmingham – Leicester service in the public timetable. This resulted in some particularly lengthy services such as those from Aberystwyth in Mid Wales to Grimsby on the opposite coast of the UK. This also gave rise to the nickname "The Barmouth to Yarmouth Railway" due to the fact Central Trains operated services in both Mid Wales and East Anglia (certain services were extended from Norwich to Great Yarmouth in the summer). Central Trains had a major shakeup between 2004–05 to prepare them for the eventual break up of the franchise. The first part of this was done in 2001 when the Birmingham New Street to Chester & Mid Wales and Cambrian Coast Line was transferred into what is now the Wales & Borders franchise. In 2004 services from Leamington Spa to Birmingham Snow Hill & Stratford upon Avon were transferred into Chiltern Railways, but the company maintained a peak hours services to and from Leamington Spa. The service between Birmingham and Stourbridge was increased to every 10 minutes and this in turn increased the Kidderminster service, as a part of the new Stourbridge line timetable all remaining Birmingham New Street trains were diverted into Birmingham Snow Hill. Liverpool Lime Street to Stansted Airport split at New Street to form two services due to problems with delays. Previously Central Trains ran services from Birmingham New Street to Nottingham via Leicester as well as Derby, this service was split, the Leicester to Nottingham service was merged with the hourly Ivanhoe Line service to Loughbourgh and was extended past Nottingham all stations to Lincoln. 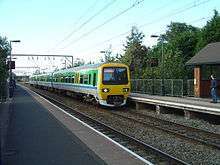 During 2004 Trent Valley local services that ran generally between Stafford and Nuneaton (some extended to / from Coventry or Rugby) were discontinued due to a Driver shortage and not restored until over year later, when they were replaced by an electric service from Northampton to Crewe. Another fatality of the ‘lack of Drivers’ was the service between Birmingham to Stafford via Walsall, services were cut back (as today) to run between Birmingham and Rugeley Trent Valley. Central discontinued their single Northampton service a day which ran to Nottingham (and other locations) via Birmingham once they gained the Birmingham to Northampton route from sister company Silverlink Trains in 2004/05. Two trains per hour from Birmingham New Street – London Euston via Northampton was replaced by one train per hour to Northampton which connected badly with onward services to London Euston (although a few trains a day did run straight through to / from London as an unofficial joint service). The Northampton service started off as an hourly express service until it was merged with the local service to Coventry adding more journey time. Coventry to Nottingham via Leicester services were discontinued after engineering work at Nuneaton station made it impossible for trains from Coventry to join the line towards Leicester and no attempt was ever made to rectify this. This service was restored in 2005 as an hourly shuttle to Nuneaton, with passengers requiring changing at Nuneaton for Leicester (and change again at Leicester for Nottingham). The local service to and from Coventry to Wolverhampton calling all stations was also changed in 2004, it was split at Birmingham New Street as Central Trains starting operating Class 321 EMUs. A later development was implemented that had trains running express from New Street to Birmingham International (with some stops at Marston Green) then all station to Coventry and services to Walsall were extended to Birmingham International calling all stations, Adderely Park station was cut down to one train per hour shortly after this. Central Trains' 158855 at Oxford in 2003, on hire to Thames Trains for Bristol-Oxford and Oxford-Bicester Town services. Considering the difficulties with which Central Trains contended, including sharing tracks with so many other operators, it did not perform too badly in its twilight months. The last figures released by the ORR (Office of Rail Regulation) rated Central Trains' performance at 84.8% for the PPM (Public Performance Measure) over the third quarter of the financial year 2007/8. This was an improvement over the same period the previous year, during which they achieved 82.7%. Their final MAA was 86.6%. They have always had a reputation for being poor performing with bad customer service though, and this may have been partly why they lost the franchise. Central Trains' 156402 in Regional Railways livery at Coventry in 2000. 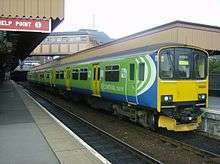 The direct service from Coventry to Skegness ceased in 2004. 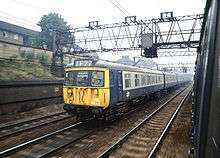 Central Trains' fleet was primarily made up of diesel multiple unit trains, with an additional fleet of electric trains in use around Birmingham. The awarding of the franchise was soon followed by multiple orders for a total of 33 new air-conditioned, 100 mph Turbostar trains, intended to boost the fleet and replace older rolling stock. Though a large number of 1980s and 1990s diesel multiple unit trains inherited from British Rail remained, the last 1960s and 70s 'slam door' trains had been retired by 2000. Over the course of the franchise, a number of the older Class 156 and Class 158 trains were transferred away to other operators including Wales & Borders and One. This was balanced by the acquisition of additional Turbostar trains no longer required by sister company Midland Mainline as well as additional Class 150 and Class 158 units made surplus by other operators. Over the years, both Class 150 and 158 trains were shuffled between two and three carriage formations to meet changing needs. The Strategic Rail Authority decision to divert rolling stock originally intended for South West Trains also saw the company benefit from a fleet of 30 new 100 mph Class 350 Desiro units, which were shared with Silverlink for use on the West Coast Main Line between Euston and Northampton/Liverpool via Tamworth. Rolling stock in 1997 consisted entirely of trains inherited from British Rail. Some, such as Class 310 and Class 312 trains were in the process of withdrawal at privatisation. By the final months of the franchise, Central Trains had a significantly more modern fleet. It was also supplementing its fleet with Class 321 and new Class 350 electric trains shared with sister company Silverlink. Rolling stock in 1997 consisted entirely of trains inherited from British Rail. Some, such as Class 310 and Class 312 trains were in the process of withdrawal at privatisation. By the final months of the franchise, Central Trains had a significantly more modern fleet. It was also supplementing its fleet with Class 321 and new Class 350 electric trains shared with sister company Silverlink. In October 2004, the Department for Transport unveiled plans designed to streamline rail franchises which included the abolition of the Central Trains franchise and the transfer of its services to other operators. It was announced that the franchise would end in April 2007, although there was a later extension until November 2007). 1 2 3 4 Knight, Steven, ed. (1997). "A comprehensive guide to Britain's new railway". Peterborough: EMAP Apex Publications. ISSN 1368-437X. 1 2 "Key Facts and Figures". Central Trains. 1 2 3 "Fleet Lists". The Junction. Archived from the original on 16 September 2007. ↑ "Train firm tackles fare dodging". BBC News. 29 August 2006. Retrieved 2 January 2010. ↑ "Train firm's timekeeping improves". BBC News. 29 March 2007. Retrieved 28 April 2010. ↑ "Train punctuality plummets". BBC News. 13 March 2003. Retrieved 28 April 2010. ↑ "No drivers means no Sunday trains". BBC News. 16 December 2005. Retrieved 28 April 2010. ↑ "Driver shortage disrupts trains". BBC News. 17 December 2006. Retrieved 28 April 2010. ↑ "Rail travellers face disruption". BBC News. 12 August 2007. Retrieved 28 April 2010. ↑ Johnston, Howard, ed. (2001). "The comprehensive guide to Britain's railways". Peterborough: EMAP Active. ISSN 1368-437X. ↑ "Archived copy". Archived from the original on 3 December 2008. Retrieved 2010-02-17. ↑ "National Rail Timetable 28 May to 23 September 2000". London: Railtrack plc. 2000. ISSN 1367-0352. 1 2 PPM actual "Office of Rail Regulation – National Rail Trends" Check |url= value (help) (PDF). ORR. ↑ "Our Fleet". Central Trains. ↑ "Press Release". Angel Trains. ↑ "Rail franchising arrangements, October 2004". Department for Transport. ↑ "Central Trains franchise extended". BBC News. 2 April 2006. Retrieved 2 January 2010. ↑ "'Nottingham split' scrapped, but hourly Norwich – Liverpool service under threat". The Norfolk Railway Society. Knight, Steven (5–18 November 1997). "Central to your Journey...". RAIL. No. 317. EMAP Apex Publications. pp. 30–32. ISSN 0953-4563. OCLC 49953699. Wikimedia Commons has media related to Central Trains.